Obituary for Overseer Dorothy Askew Pass | Frank R. Bell Funeral Home, Inc. Flowers discharge their brilliant ministry of love, elaborate their seed and die, but not until their work is done. Death stares us in the face on all sides. Fields that are green today are now brown. God teaches in his word "All flesh is as grass, and all the glory of man is as the flower of grass. The grass withered and the flower fades away. " Death to the Christian is moving out of this world into the eternal bright side and silver lining of the eternal daylight. 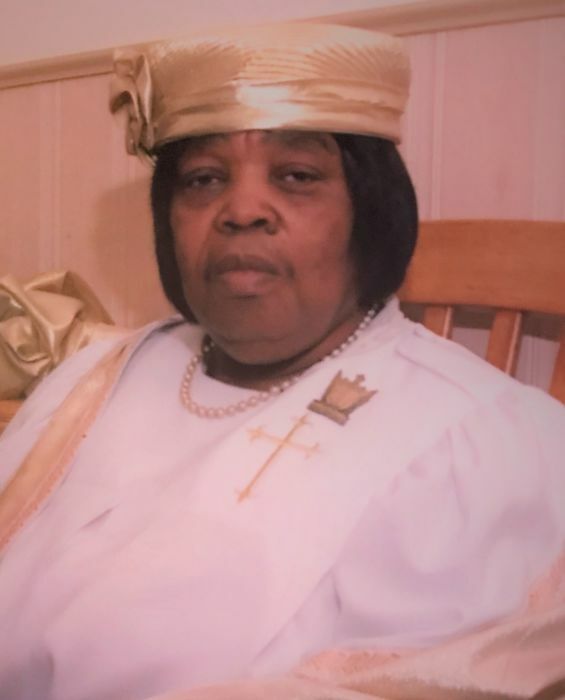 On Tuesday, February 5, 2019, God's angel came and bore the spirit of Overseer Dorothy Askew Pass, away to the land free from sickness, pain and death. .
Dorothy Askew Pass the daughter of the late Harry James and Lucille Sampson was born July 25, 1938, in East Orange, New Jersey. Dorothy was the baby girl of the nine siblings of the family. As a child Dorothy always loved church and feared the Lord at an early age. Dorothy would sight that her mother and father sang on the choir in the Disciples of Christ church the family attended; "He's My Rock My Sword and Shield." At the age of twelve Dorothy moved to live with her sister and husband, Edna and Bernie Spencer after the death of her mother. Dorothy received her early education from the Washington County Schools in North Carolina. Dorothy received Christ as her personal savior as a young girl in Bethel under the leadership of the late Pastor Edna Spencer, of Creswell, North Carolina. Dorothy relocated to Brooklyn, New York at the age of eighteen. The late Bishop Beulah Counts brought her to New York claiming she brought a bunch of beautiful grapes back with her to New Hope Pentecostal Church of Greater Mount Zion Churches, Inc. Dorothy lived with Bishop as a daughter. Dorothy met and married the love of her life, Joe Ernest Pass, on December 9, 1961. From this union four children were born, Milton Ernest, Jacqueline Michelle, DuWayne Clark and Ronald Anthony. This union of 46 years and Eve months was blessed by God until Bishop Pass was called home in May of 2008. Dorothy was employed by Cumberland Hospital as a Nurse Technician. Dorothy retired after 30 years of service in June of 1990. Dorothy was a woman who wore many hats. Dorothy was a wife, mother (good cook), grandmother, sister, aunt and friend. As the preacher's wife she was diligent and faithful. Dorothy served her God, her church, husband and family. Dorothy as a wife only saw Joe her husband. If you saw one, you saw the other. Dorothy as mother was strong and protective. Dorothy as a grandmother wanted all her grand children to know the Lord, as she would teach them the Lord is my shepherd 1 shall not want. Dorothy as a sister was dedicated to her siblings. Dorothy as an aunt loved all her nieces and nephews. Dorothy as a friend was loyal. Dorothy was a giver. She was one of the most giving people that you could meet. She would always give to the poor and needy. Reaching into her pocket book was something that she would always do if someone needed or asked. In God"s house she gave all that she had to see the work go and the ministries continue. Nothing was too good for her God; he came first in her giving.Dorothy was a worshiper, always shouting and praising God. Dorothy had a voice that would touch and penetrate your soul. She often would stand at the organ, poised, standing firm and begin to sing hymnals and songs of Zion. Some of her favorites were, "Be Not Dismayed God Will Take Care of You, Blessed Assurance Jesus is Mine, When I've Gone the Last Mile of the Way, We are Our Heavenly Fathers Children, Without God my Life Would Be Nothing. So many songs could be named but the last two that she would be heard singing always in church would be "It's a Highway to Heaven and I know That I Can Make It." Dorothy served under the late Bishop Edna Spencer, Bethel Church of Creswell, North Carolina; the late Bishop Beulah Counts of New Hope Pentecostal Church, the late Bishop Harry Sayles of Christ Church and the late Bishop Joe Pass of Solid Rock Pentecostal Church, Inc. all of Brooklyn, New York. In 1981 Dorothy was called into the ministry to preach the gospel and assist her pastor and husband as a missionary. She moved in the ranks of the ministry as a missionary, minister, evangelist and elder. The Lord called her to lead the church as Pastor and Overseer upon the death of Bishop Joe Pass, Pastor of Solid Rock.Everyone she met, she would witness to them about who Jesus was. On the stoop she would sit and call to those passing by and invite to her church. Dorothy was always witnessing and inviting anyone and everyone about Jesus. She served faithful and strong until her health declined. She continued to serve as Overseer over the church of God until God called her home. Her Christian life was as the fragrance of a beautiful rose and her influence will live on in the lives of those she touched. Dorothy leaves to celebrate her memory her four children, Milton (Natashia) of Raleigh, N.C.; Jacqueline McClellan (Gary). DuWayne (Joanna) of Brooklyn, New York and Ronald (Robin) of Queens, New York; one special daughter-in-law, Gwendolyn McCrae-Cain of Brooklyn, New York, seven grandsons, Cedrick, Jamel, Marcus, Demetrius, Fernando, Isaiah and, Nathaniel; five granddaughters, Kimberly, Latanya, Je'nesia, Makayla and Madalyn; eleven great-grand children, Kristen, Cameron, Amiyah, King, Jamel Jr., Jahizer, Jakari, Matt. Valencia, Markiah, and Tangelo, one sister-in-law, Betty Newby of Hampton, Virginia; a host of nephews, nieces and cousins, the Solid Rock Church family, three special sisters, Pastor Aileen Scott, Bishop Geraldine Scott and Irene Floyd; one God-daughter, Okeema Davis; Anna Avila her caregiver and friend. Rest in the arms of our loving savior, submitted in love, the family.